The one everybody is talking about! A very unique fine blend of pure meat proteins, added meat meal and a few other secret ingredients. Pungent attraction is guaranteed! When you open a bag you'll see what we mean. A perfect partner to all meat and pellet baits, this super fine grade groundbait has decimated fisheries all over the country. A true one off all-rounder that packs a punch! 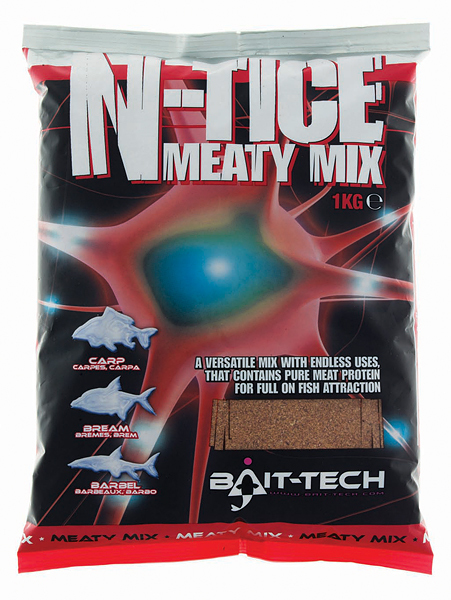 N-TICE Meaty Mix not only attracts fish into the area it also stimulates fish into a feeding frenzy thanks to the complex, superior ingredients. Having undergone more extensive testing than any of our other Bait-Tech mixes this highly attractive concoction was two years in the making. Extensive trialing by our top anglers has seen N-TICE Meaty Mix blow rival mixes out of the water when fished side by side with the competition. Ideal to use when targeting carp, bream and barbel.